Invented at Brennan’s restaurant in New Orleans in 1951, bananas Foster quickly became a de facto guy dessert. Why? Well, the booze (151 rum) helped and so did the fire—the former to fuel the latter. So did the theatrics of flambéing the dessert tableside. 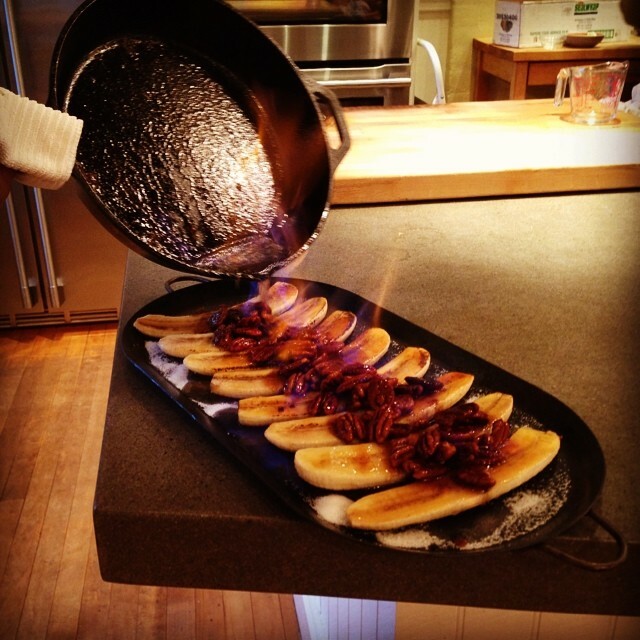 Here’s an updated bananas Foster, using one of the handiest tools for tableside drama: a blowtorch. This gives the bananas a hard candy crust, augmented with an optional rum-pecan panfry and ice cream. There are three ways to approach these bananas Foster—from simple to elaborate—all awesome. On the simple end, you cut the bananas in half, sprinkle them with sugar, and caramelize them with the flame from a blowtorch. If you’re feeling more ambitious, make the rumpecan panfry to serve over the bananas. To go the full monty, serve the bananas and rum-pecan panfry over ice cream, flambéing the whole shebang with more rum at the table. If you are making the simple version: just before serving, cut the bananas in their skins in half lengthwise. Gently remove the skins and arrange the banana halves cut side up in a large cast-iron skillet or on a heatproof platter. Sprinkle the tops of the bananas with a light, even layer of granulated sugar. Fire up the blowtorch and point it at the bananas to melt and brown the sugar. Let the bananas cool for about 1 minute; the sugar will turn into caramel. Dig in. The point of the blowtorch’s flame should be about 1 inch above the bananas. If you are making the more elaborate version, with rum-pecan panfry: before preparing the bananas, make the rum-pecan panfry. Melt the butter in a skillet over high heat. Add the pecans and brown sugar and cook until bubbling and the sugar is melted, about 3 minutes. Stir in the ¾ cup of rum and let it boil until thick and syrupy, about 3 minutes. Cut and caramelize the bananas as described for the simple version. Spoon the warm rumpecan panfry down the center of the bananas and serve. If you are making the full monty: after you have made the rum-pecan panfry and caramelized the bananas, scoop the ice cream into 4 shallow heatproof serving bowls. Dim the lights and flambé the bananas again with the ⅓ cup of 151 rum. Top each serving of ice cream with a caramelized banana and some rum-pecan panfry. Buy bananas that are ripe but still firm; the skins should be yellow with a light speckling of sugar spots (tiny brown dots).